Without concerted action, socio-economic divides across the country are likely to widen. It is critical that we understand what these changes mean, and that the skills system adapts accordingly to ensure every city is equipped to respond to these changes. Analytical and interpersonal skills are becoming increasingly important in all UK cities. In recent years, technological change has meant that interpersonal and analytical skills, such as negotiation, coordination and critical thinking – skills that complement machines – have become more important, whereas physical skills have decreased in demand. These changes are explained by two main factors: the changing composition of the labour market and changes in the skills sets required within existing occupations. Employment in the UK has continued to polarise with a decline in routine manual occupations and a stronger bias towards high-skilled occupations. This has resulted in a significant increase in the demand for analytical and interpersonal skills. The importance of analytical and interpersonal skills is also increasing within existing occupations. Tasks requiring analytical and interpersonal skills are less easily replicated by machines compared to those requiring physical skills, meaning that they are likely to be increasingly important in the future. However, variation in attainment and participation suggests that some cities, particularly in the North and Midlands, are less well equipped to adapt to these changes. Educational attainment, participation in extra-curricular activities and work experience all help to prepare young people for the future world of work. Lifelong learning, meanwhile, can help adults adapt and progress in response to these changes. Yet there are huge disparities between places at all education stages. 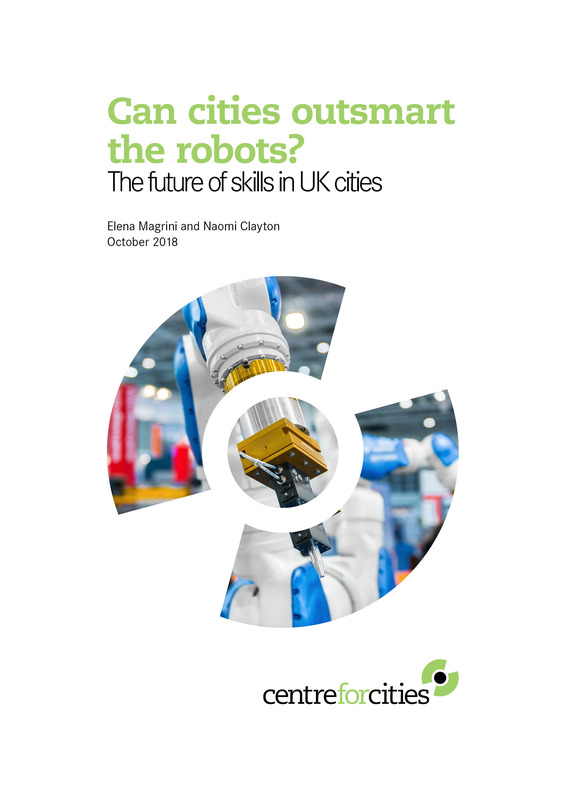 In general, there are lower levels of attainment and participation in activities that support the development of these skills in cities outside the Greater South East — with the system failing to endow individuals with the skills they need. While a broader set of economic development interventions are needed to support economic growth and to increase demand for analytical and interpersonal skills, urgent action is needed to ensure individuals have access to opportunities to develop these skills at every stage of their lives. Cities should establish Skills Compacts to promote collective responsibility and action for improving education and training. City leaders and metro mayors should bring local stakeholders together — including schools, FE colleges, training providers, universities, businesses and the third sector — to commit to increasing learning and improving outcomes in their city. The Compact should aim to ensure better coordination among organisations, share knowledge and best practice, and raise awareness of existing initiatives to improve the quality of opportunities and access to them. To measure progress, partners should set measurable targets that reflect the goals set by the Compact. The Department for Education and the devolved administrations must match local efforts with increased flexibility for cities to experiment and tailor provision. Different places face different challenges related to education and what works in one place might not work in another. The Department for Education (DfE) should acknowledge these differences and work more closely with the Compact’s stakeholders to increase flexibility in provision, pilot new initiatives and allocate resources in a way that is reflective of local needs. The Department for Education should lead on creating a common framework to define interpersonal and analytical skills. The language and definitions used to describe these skills often varies, with references to ‘employability’, ‘soft’, ‘vital’ and ‘transferrable’ skills, among others. This results in a lack of clear understanding of what skills individuals need to succeed in the labour market. DfE should work with employers and skills experts to establish a clear definition of the interpersonal and analytical skills that are needed for current and future jobs, and review how they can be embedded in each educational stage. This would help ensure these skills are better valued, improve learning opportunities, and support the identification of good practice. The Government should take a cross-departmental approach to raising investment and participation in lifelong learning, supported by a new What Works Centre for Adult Education. As the nature of jobs continues to evolve and people work for longer, it is crucial to ensure that individuals that have already left compulsory education can up-skill and retrain. Government departments need to work together to raise awareness of opportunities and remove barriers to them, including financial ones. To be effective it is essential that this builds on lessons from the past and is supported by evidence on what works.